Belltech Business Card Designer Pro helps you design and print your own business cards right-away from professional quality business card templates and logos in minutes. This card maker software supports papers from Avery, Sigel, DECAdry, Herma, Formtec and more. This has great design tools, graphics and background images to help you design your own cards, like a pro. Add your logo, art work, text, shadow, color, modify design until satisfaction. 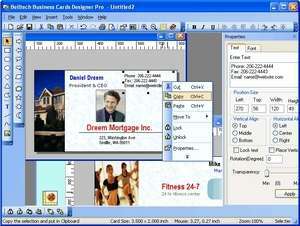 Business Card Designer Pro 5.4 is a shareware program and can be used as a demo to try the software until the free trial period has ended. A full version of the program is available after the trial period ends. For security reasons, you should also check out the Business Card Designer Pro download at LO4D.com which includes virus and malware tests. Additional screenshots of this application download may be available, too. Belltech Business Card Designer Pro has a presence on social networks.